You thought P3.5-B was bad? Well, here's one for P4.8-B! In study subjects of (2-16 years of age) without prior dengue infection, data suggest modest efficacy (15%-32%) of vaccine against symptomatic dengue until the second year of follow up. Subsequently, starting during year 3, the risk of hospitalized and severe illness becomes higher than among controls. Those who have never had dengue and were given Dengvaxia are provided a 15%-32% resistance from severe dengue for two years after getting the first dose. After that, the risk for severe dengue becomes higher compared to those who weren’t vaccinated. First, there is virtually no “protective period”, contrary to what local authorities say. WHO clearly stated that Dengvaxia does not provide immunity from Severe Dengue in any way, shape, or form for those who have never had dengue before (seronegative). Instead, Dengvaxia provides resistance against severe dengue for the first 24 months, a 15-32% resistance which can best be described as “minimal”. This WHO statement squarely contradicts Health Secretary Duque’s earlier claim that first dose provides a 30-month protective period [FB]. Where did Sec. Duque get his numbers, from Sanofi? I don’t know, but one thing’s clear: Sec. Duque does not completely understand what he’s talking about. Second, a seronegative recipient is more likely to get severe dengue 24 months after initial dose, compared to seronegative individuals who never received Dengvaxia. I think I do not need to explain this second point anymore. While there seems to be a general consensus that much of the kids inoculated with Dengvaxia are seropositive, the fact remains that no mass testing was done prior to the mass vaccination program. That is, it’s virtually impossible to pinpoint who among the over 830,000 recipients are seronegative. Parents of Dengvaxia recipients need to be educated about these things as soon as possible. They should be taught about what can be done for now, what to expect after the 24-month period, and what to do if and when their child contracts Dengvaxia-assisted Severe Dengue. Consulting a doctor as soon as possible is probably the best way for parents to get some peace of mind. However, the country suffers a shortage of 15,000 doctors, with only 1 doctor per 33,000 Filipinos [CNN]. Moreover, visits to the doctor is out of reach for many, with one EU-funded study showing that each outpatient visit costing Php 378 on the average [Tsilaajav 2009], roughly equivalent to one entire day’s wage for workers in Central Luzon, NCR, Central Visayas, and Calabarzon [PSA], the regions where mass vaccinations took place. Add the fact that public school children typically come from poor families make medical consultations out of reach for a vast majority of the victims. But surely, educating the parents of Dengvaxia victims can be done through health centers, right? We have barangay health centers, right? In line with the graft complaint arising from the Php 3.5 billion mass vaccination program, Department of Justice Secretary Vitaliano Aguirre issued yesterday an Immigration Lookout Bulletin Order [DoJ] against the top officials of the Aquino Administration and the contractor Sanofi. Yes, the P3.5-billion Dengvaxia Deal seems anomalous in itself, but what make matters worse is that one of the temporary solutions to the Dengvaxia mess – Barangay Health Centers – is mired in an even big controversy… a controversy to the tune of P4.8 billion pesos. Barangay Health Centeres are probably the most effective tools to educate the public about Dengvaxia, to tell them about what to expect, and to teach them how to prepare for whatever those expectations are. Unfortunately, out of the 42,000 barangays in the country, less than half have such facilities. 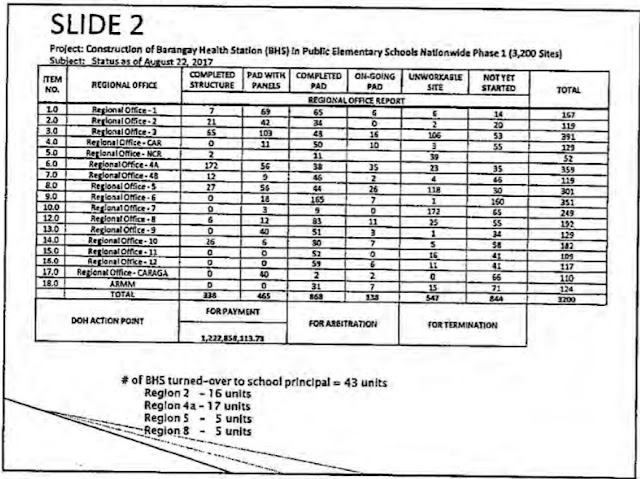 In an apparent attempt to address this shortage, the Department of Health in 2015 launched a massive P4.8-billion program to construct 3,200 Barangay Health Stations throughout the country, more commonly known as “School-based Barangay Health Stations”. At first glance, the reasoning behind the program is generally sound: build health centers, which will also double as school clinics, on school grounds to avoid land ownership issues, among other reasons. The government allocated Php 4.8 billion for the project, with the winning bidder JBros Construction offering to do it for Php 4.45 billion. 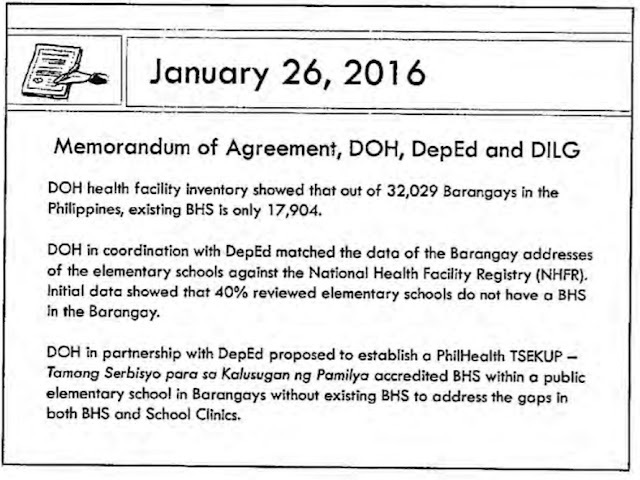 Awarded in December 2015, JBros was supposed to complete all 3,200 Barangay Health Centers by September 2016. As of August 2017, however, the contractor managed to complete only 338 Barangay Health Centers, or just a little over 10% of the 3,200 promised, with no signs of it completing the remaining 90% anytime soon. About a third of the 3,200 – 1,051 – are supposed to be built in Regions 3, NCR, 4A, and 7, or the four regions where mass anti-dengue immunization programs took place. Of this number, the contractor managed to complete only 239. That is, at least 812 barangays from Dengvaxia-affected regions will not have Barangay Health Centers. Incompetence would be the knee-jerk explanation for this mess. A deeper look, however, reveals a very different, and more tragic story. Department of Budget and Management Sec. Butch Abad released the infamous Special Allotment Release Order (SARO) for Dengvaxia worth Php 3.5 billion on 29 December 2015. What many seemed to have overlooked, however, is the release of an even bigger SARO, one for Php 9.4 billion, to fund the Department of Health’s Health Facilities Enhancement Program (HFEP). I am uncertain as to where the P3.39 billion and P639 million chunks went and I can do little about that given available data. However, I have more than enough information about Php 5.36 billion for hospitals and health centers, where P4.8 billion was allocated for the construction of Barangay Health Centers. Congress obviously didn’t provide a budget for the construction of Health Centers in 2015, that’s why the Php 9.4 billion SARO had to be issued. 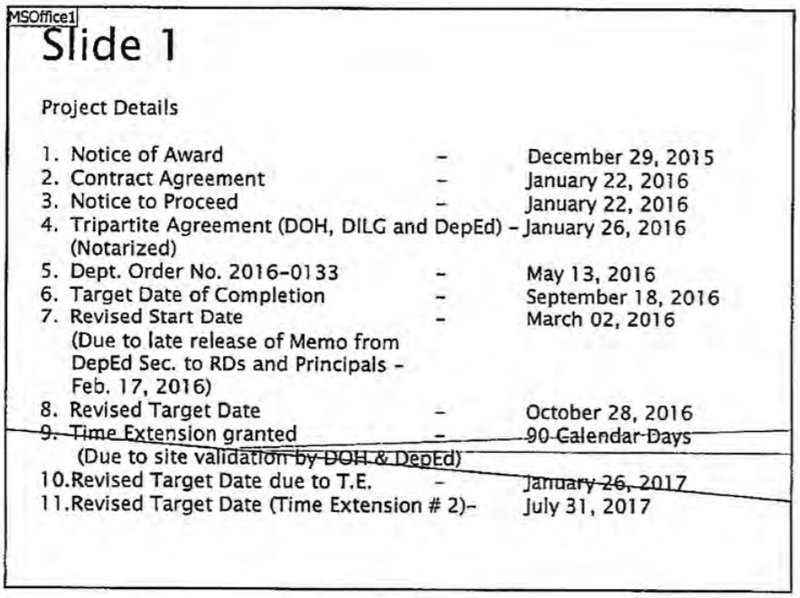 Despite this, the Department of Health started the procurement process on 25 June 2015 and it found a “qualified bidder” by 09 September 2015, all these in spite of the lack of funding for the project. How can the government bid out a massive Php 4.4 billion contract if it doesn’t even have the money for it? That’s illegal, but why did Garin still choose to do it? Well, Aquino and Abad already had a plan in as early as 2015: to get money from the funds for Philhealth coverage for senior citizens, as fund that was mandated by the Expanded Senior Citizens Act, a fund that is expressly stated by Law to be spent for that purpose and that purpose alone. I will explain how Abad and PNoy bastardized Philhealth through this SARO in another article. For now, let’s focus on the health centers because this issue in itself is already ridden with so many irregularities, one ThinkingPinoy article may not even be enough to explain it. Budget Sec. Abad issued the Php 9.4-billion SARO despite full knowledge that it’s illegal per a February 2015 Supreme Court ruling against the Disbursement Acceleration Program (DAP), and I have reason to believe that Abad was intent on violating the law from the very start. In 2014, President Aquino’s issued a veto message for the 2015 National Budget. With respect, however, to senior citizen beneficiaries, the provisions of R.A. No. 10645 (Expanded Senior Citizens Act), shall be applied, taking into consideration those already covered under the National Health Insurance Program (NHIP)… The additional beneficiaries authorized under these provisions shall be funded through the Unprogrammed Fund. In all instances, the implementing agencies shall ensure that no overlapping of beneficiaries under the NHIP takes place… The DOH and DSWD shall issue the guidelines to further clarify the foregoing conditions and ensure the successful implementation of the expanded NHIP under these provisions [Gazette]. In simpler terms, Aquino said he will determine how much Philhealth needs from the P10.6-billion fund instead of simply giving Philhealth the entire amount, arguing that there may be an “overlapping of beneficiaries”. In short, Aquino set the stage for the manipulation of the P10.6 billion fund, a fund that Aquino later used to illegally fund the health center contract. 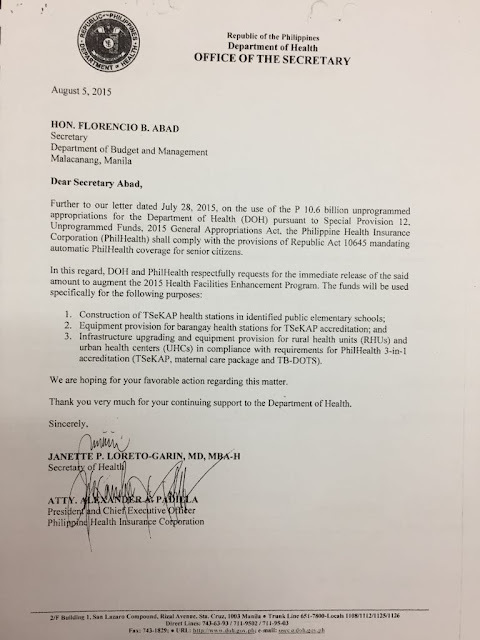 ThinkingPinoy acquired a copy of a Philhealth board presentation from a senior Philhealth official whose identity shall be withheld for his or her safety. The presentation may be found here. According to Philhealth, Php 10.6 billion from sin taxes collected in 2014 was supposed to partially pay for the over P12.15 billion that Philhealth owed various healthcare establishments as of 2015, in accordance with the law, which mandates free Philhealth coverage for all senior citizens [RA 10645]. The law, again, is clear: P10.6 billion goes to Philhealth for senior citizens, period. And rightly so, because according to a confidential document that ThinkingPinoy obtained from a highly-placed source in Philhealth, the state medical insurance company owed hospitals over Php 15-billion as of 2015, so that the Php 10.6 billion could have reduced those arrears by two-thirds. But President Aquino thought otherwise. On 05 August 2015, Health Sec. Garin and Philhealth CEO Alexander Padilla wrote to Budget Sec. Abad, informing the latter that Philhealth can provide coverage to senior citizens without having to touch the P10.6 billion funds. Moreover, Garin and Padilla requested Abad to realign the P10.6 billion towards the construction of Health Centers. We all know that Philhealth has always had financial issues so it’s confusing to see a Philhealth CEO telling DBM that they have enough money. SIDE NOTE: Alex Padilla is currently one of Senator Leila de Lima's legal counsels. 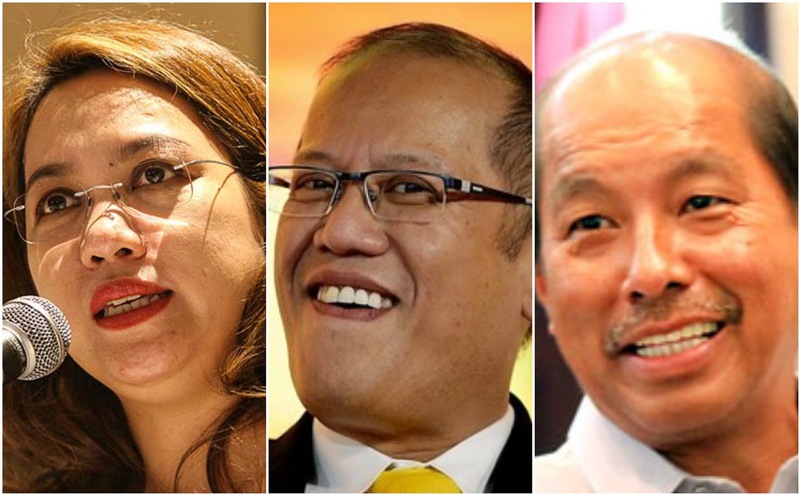 A day later, Garin sent Abad a letter detailing the proposed breakdown of the prospective SARO. 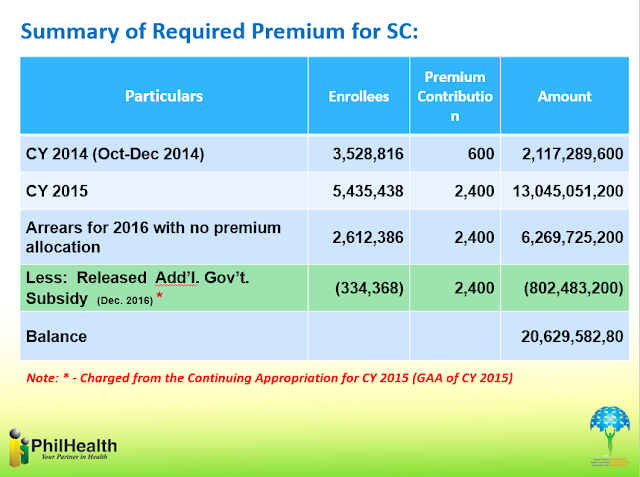 Isn't it amazing how Garin's "needs" match Philhealth's Php 10.6 billion up to the last cent? The Php 9.4 billion SARO was issued on 29 December 2015. December 30 (Rizal Day) and December 31st (last day of the year) were holidays, so Garin had less than 8 work-hours to award the contract. But if there’s a will, there’s a way: Garin managed to award, at lightning speed, a P4.4 billion to JBros Construction, the winning bidder for the school-based health center contract. The contract was signed by Health Sec. 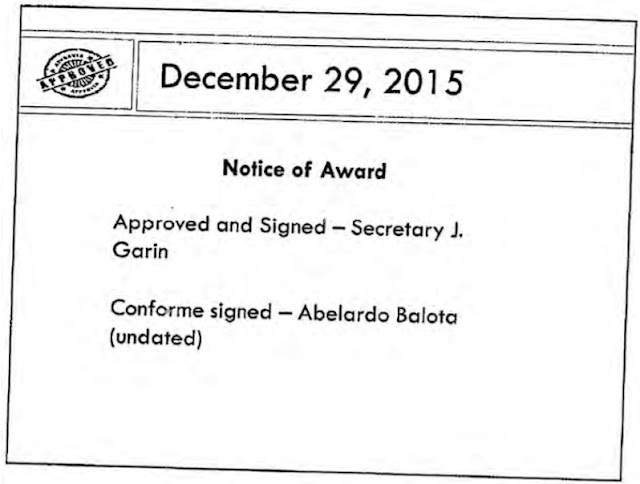 Garin and JBros Construction’s Abelardo Balota, with the contract agreement executed a few weeks later on 22 January 2016 (CA No. GOP-C-2015-042), for the amount of Php 4,456,592,239.41. The required time of completion was 240 calendar days, with Notice to Proceed (NTP) dated 22 January 2016, i.e. all 3,200 health centers must be completed by 28 October 2016. At this point, it’s already clear that the funding for the massive health center construction program was illegally obtained. Unfortunately, that isn’t the only thing irregular about this contract. The Php 4.45 billion contract is for the construction of 3,200 health centers, so that’s about Php 1.4 million per Health Center. That’s pretty hefty, especially since only 52 of the 3200 health centers are in NCR, and the contractor doesn’t even have to purchase land, as the structures will be built inside schools, i.e. DepEd property. The contract states each of the 3,200 buildings will be 6 meters by 7 meters, i.e. each has a floor area of 42 square meters. Dividing Php 1392685.07 by 42 sq. m., we get Php 33,159 per sqm. Php 33,159 is about thrice the average cost of non-residential construction, which is Php 10,265 as of 2014. Moreover, each health center will be built with steel sandwich panels, i.e. two thin layers of steel with foam insulation at the core, similar to buildings made from container vans. That is, the buildings are supposed to be a lot cheaper than concrete buildings, but it isn’t the case. 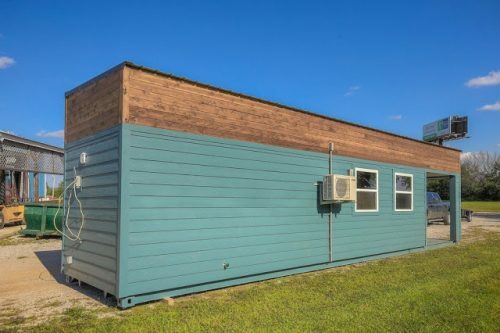 Each completed health center will not be very different from this container building. In short, the buildings under this contract appear to be substandard and severely overpriced. Sec. Garin gave the contractor a Notice to Proceed on 22 January 2016, i.e. JBros Construction was supposed to start constructing the 3,200 health centers right away. However, it’s confusing for me to discover that DoH signed a Memorandum of Agreement with DoH and DILG only on 26 January 2016, or four days after the Notice to Proceed. For example, the Department of Education issued relevant orders to public schools via DepEd Memorandum No. 27 s. 2016 only 17 February 2016, or almost one month after the Notice to Proceed. The Aquino government was in a rush to allocate the funds even if the project was still -- and is still -- half-baked. 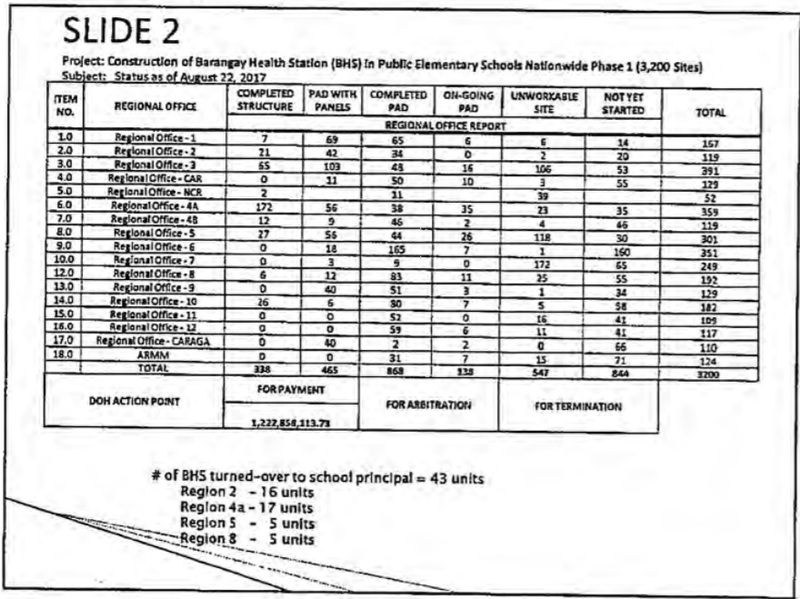 To make matters more complicated, Garin awarded the contract even BEFORE the 3,200 construction sites were validated, as evidenced by the DepEd memo instructing school division superintendents “to conduct validation of schools” to check if “there’s buildable space”. 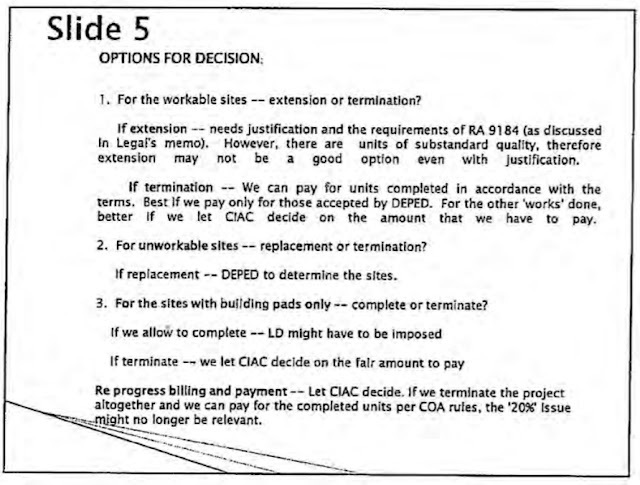 As it turns out, a lot of the proposed construction sites cannot be used. Among the reasons are  unavailable space,  space reserved for a future classroom,  flood prone area,  existing barangay health cente , construction declined by school principal. Yes, some of the schools in the 3,200-strong list do not even exist anymore! 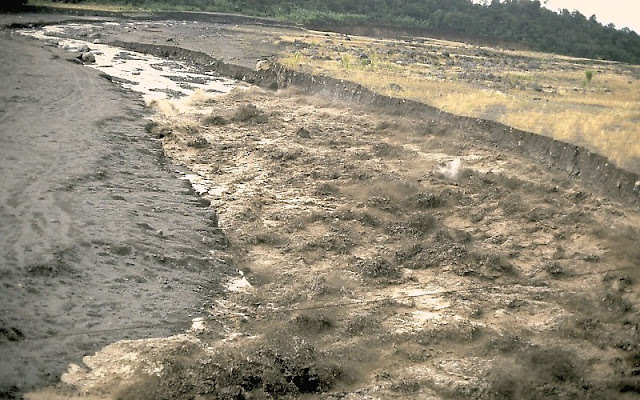 Some of the construction sites are UNDERNEATH lahar. Yes, the Aquino Government awarded a multi-billion-peso construction contract even if it isn’t even sure if construction can be performed in the first place. 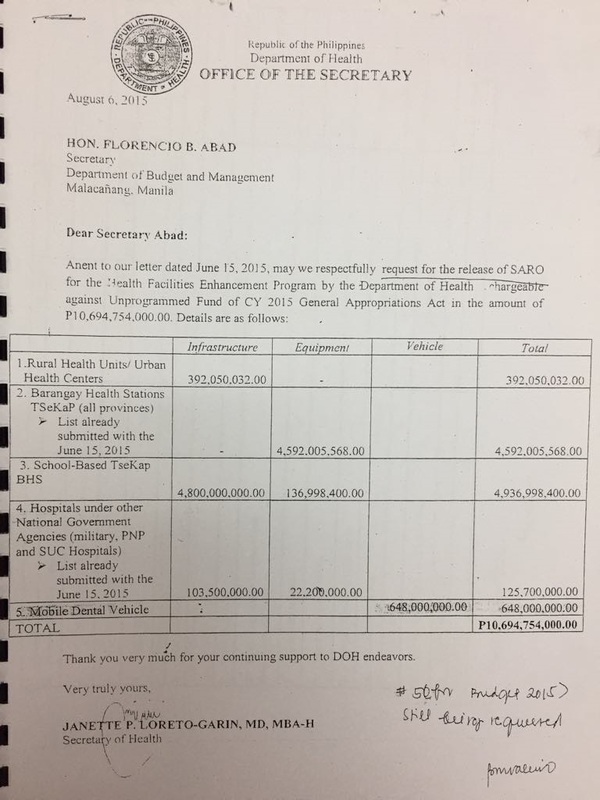 Garin, Abad, and Padilla, were so desperate to get hold of the Php 10.6 billion Philhealth Funds, which would have been inaccessible if they tried to get it in 2016. 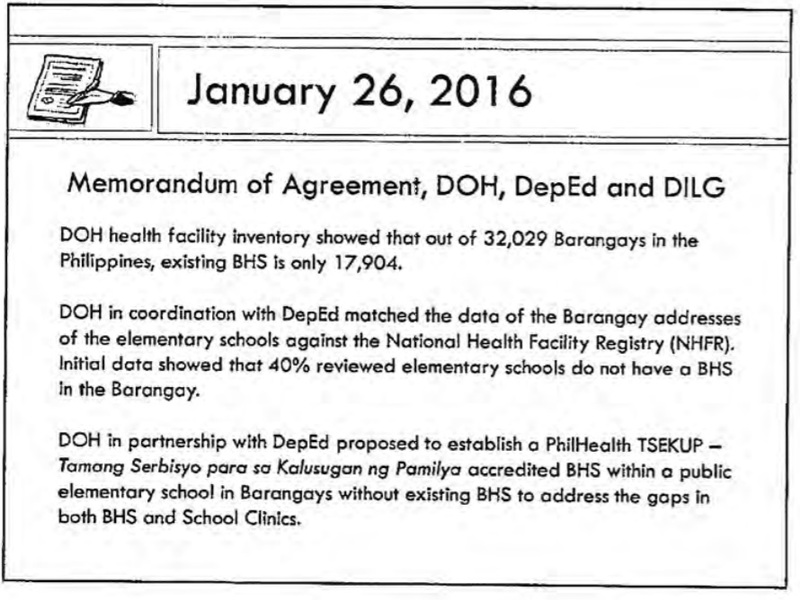 Just when we thought that the proposed school-based barangay health centers were already overpriced, the contractor issued a Variation Order (price increase request) for Php 416.5 million, which was approved by no other Health Sec. Garin on 30 June 2016, or the last day of Aquino Administration. The Government supposedly allocated Php 4.8 billion for the contract. But to theoretically provide the best deal for the government, the contract was still bid out. JBros bid Php 4.4 billion, which appears that the government “saved” Php 400 million…but JBros increased the bid to P4.8 billion after contract award… AND GARIN APPROVED IT. Why did even bother bidding it out if we will max out the budget anyway? Worse, the Php 416.5 million variation order would have put the total contract price at Php 4.873 billion, which EXCEEDS the approved budget for just Php 4.8 billion by a whopping Php 73 million! 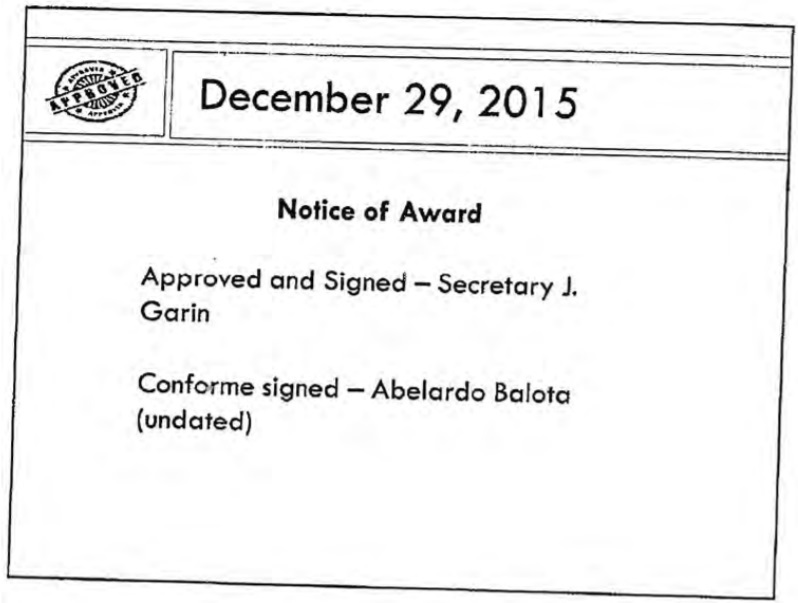 Despite the Variation Order being illegal, Garin still approved it. 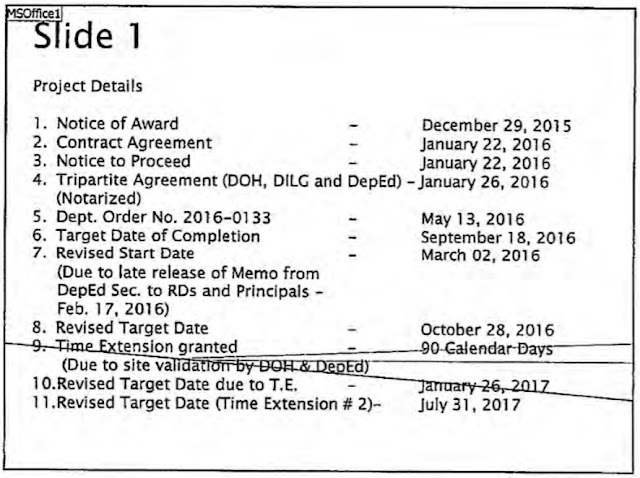 The Notice to Proceed was issued in January 2016 but the start date was revised to March 2016 because DoH’s agreement with DILG and DepEd came in late, so that the target completion date was moved to October 2016. The target completion date was further moved to January 2017, then it was further moved to July 2017. What we see here is a very poorly planned project whose contract was rushed to meet the December 2015 deadline for DAP Funds. That is, the Aquino Government didn’t mind the fact that the project will experience massive problems, as long as they can release the Php 10.6 billion from Philhealth. The Department of Health under the Duterte Administration is seriously mulling the termination of the contract, though it appears that the contractor is resisting the plan. 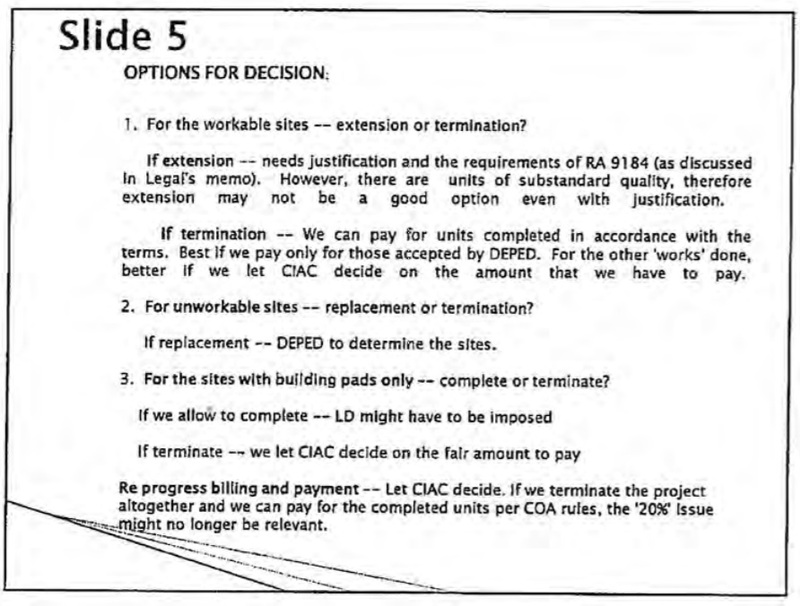 Why is the contractor intent on continuing despite the myriad logistical, legal, and financial problems hounding the contract? Highly placed government sources told me that contractors typically pay kickbacks shortly after a contract is awarded. That is, contractors pay corrupt officials even before they actually get paid for the contract. That is, they told me that it’s not unlikely that the contractor may have already paid Garin, Abad, and Padilla their respective “shares”. That is, if the Duterte Government terminates the contract, the contractor may not be able to recover the amount it already paid to the officials of the previous administration. Just a about 300 of the proposed 3,200 health centers have been completed as of August 2017. So much, exactly, did Garin, Abad, Padilla earn from the health center contract? Let the NBI check that out. Graft and corruption is a serious issue in itself, but we can’t ignore an even bigger problem arising from this mess: the non-existent Health Centers. The Duterte Government has two possible courses of action:  let construction continue, i.e. allow the contractor to build overpriced and substandard health centers, or  terminate the contract. I believe that the first option is not viable as that may be tantamount to the current government being complicit with the abuses of the past administration, and this leaves us with second option, which is to terminate the contract. However, terminating the contract will inevitably lead to lawsuit, and it’s a question on which among the contractor and the Department of Health will be the plaintiff and the defendant. This prospective court case will most likely drag on for years because  the government never settles cases and  the courts are widely known to be ridiculously slow in resolving cases, with cases of this magnitude typically dragging on for ten years or more. SIDE NOTE: If I were to put myself in the contractor’s shoes, I’d simply file a case to get a Temporary Restraining Order, wait for a few years for Duterte to step down, make sure a Liberal Party-aligned president takes over, then ask the new LP-led administration to proceed with the contract. There is a pressing need for more health centers because of the Dengvaxia scandal, health centers that worried parents can go to for crucial health information. With this botched P4.8-billion contract, however, we can “look forward” to about 3,000 barangays with no health centers for the next ten years or more, with about a third located in the regions where mass immunizations took place.